"Probate" is the term for handling a deceased person's estate through the courts. 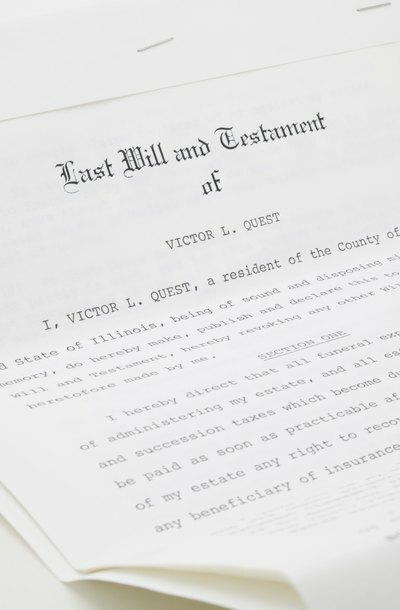 Each state has its own laws about probate, but generally the process starts with filing the deceased person's will with the court and determining whether it is valid. The judge appoints an executor who gathers the person's assets, including money, real estate, vehicles and personal items. The executor pays valid debts and eventually distributes remaining assets according to the terms of the will. After paying taxes and submitting an accounting to the court, the executor closes the estate. The executor does not handle non-probate assets, such as life insurance proceeds. Certain types of assets do not go through probate. These non-probate assets pass to another person by contract, trust or rights of survivorship set up by the deceased person during his lifetime. Retirement accounts and life insurance benefits, for example, pass to the beneficiary named on the contract. Property owned by the deceased and another person as joint tenants with right of survivorship passes automatically to the survivor. A "payable on death" clause allows such assets as stocks, bonds, CDs, bank accounts, and savings bonds to transfer to the survivor without going through probate. Property held by the deceased in trust for another person also passes to the beneficiary as a non-probate asset. Unless an asset was set up by contract, trust or survivorship arrangement to pass automatically to another person, it is probably subject to probate. Examples of probate assets include bank accounts or real estate held in the deceased person's name alone or with another person as tenants in common without right of survivorship. If you own valuable personal property, including jewelry, collections, fine art or furniture, those items will also go through probate. Many people leave specific bequests in their wills if they want particular items to go to specific people. Many states have a simplified procedure for small estates that allows assets to pass to beneficiaries without the need for probate. In California, for example, an estate worth no more than $100,000 does not need to go through probate. The small estate limit is $50,000 in Texas, but this figure does not include the value of the homestead, non-probate assets or personal property. It is important to make sure your beneficiary information and your will are up-to-date. If you have non-probate assets, such as life insurance or bank accounts payable on death to someone else, the assets will pass to those beneficiaries regardless of what your will says unless the named beneficiary is an ex-spouse or a person who has already died. If you create a trust, marry, divorce, have a child or change the way property is titled, consider revising your will to make sure your wishes are carried out after your death.